冀世锋, 王志远, 李十盛, 张先进, 高春梅, 胡茂刚, 金晓莉. 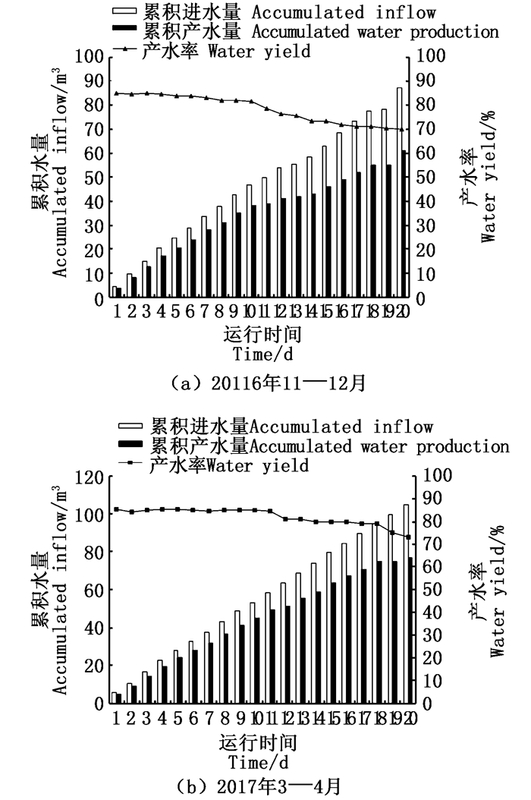 膜浓缩农药废水的工程应用[J]. 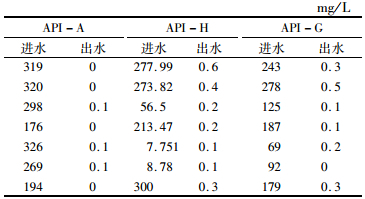 上海海洋大学学报, 2019, 28(1): 117-124. JI Shifeng, WANG Zhiyuan, LI Shisheng, ZHANG Xianjin, GAO Chunmei, HU Maogang, JIN Xiaoli. Engineering application of membrane concentrated pesticide wastewater[J]. 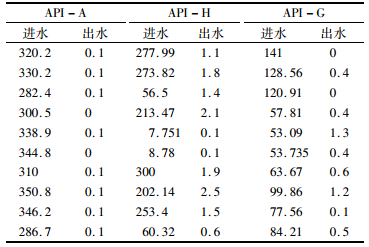 Journal of Shanghai Ocean University, 2019, 28(1): 117-124. 韩飞, 康国仙, 王棋, 等. 制药工业废水处理及其脱色的研究进展[J]. 江西中医药, 2015, 46(11): 70-73. HAN F, KANG G X, WANG Q, et al. 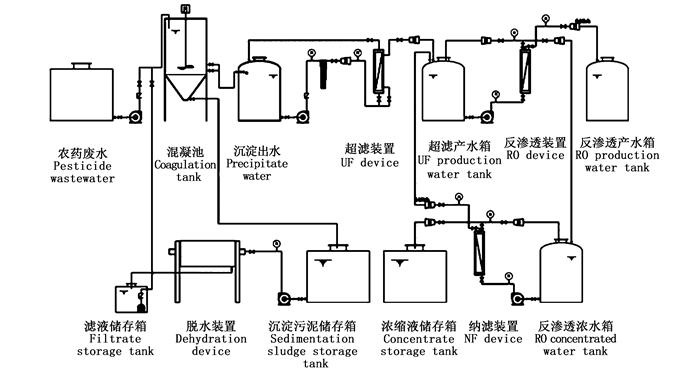 Research of wastewater treatment and decolorization in pharmaceutical industry[J]. 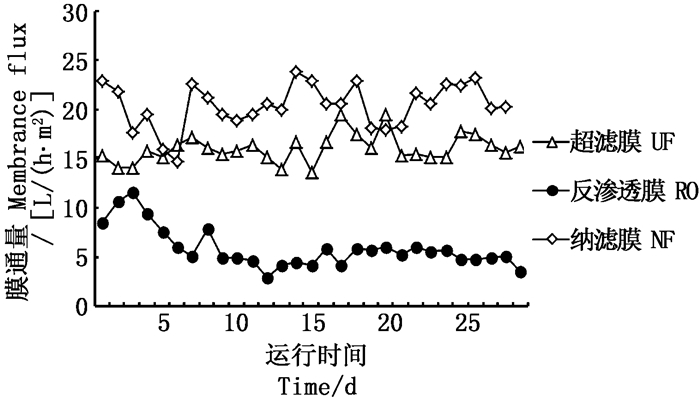 Jiangxi Journal of Traditional Chinese Medicine, 2015, 46(11): 70-73. 孟妮, 王峰, 周振. 制药废水药物活性成分的环境影响评价与管理初探[J]. 广东化工, 2011, 38(10): 217-218, 216. 贺亚峰. 危废焚烧处理[J]. 能源与节能, 2014(10): 110-112. 张永梅, 孙洁, 吴茂. 焚烧法处理高浓度有机农药生产废水[J]. 给水排水, 2008, 34(1): 59-61. 罗哲. 农药行业三废综合治理焚烧技术及应用[J]. 中国农药, 2010, 6(9): 15-20. 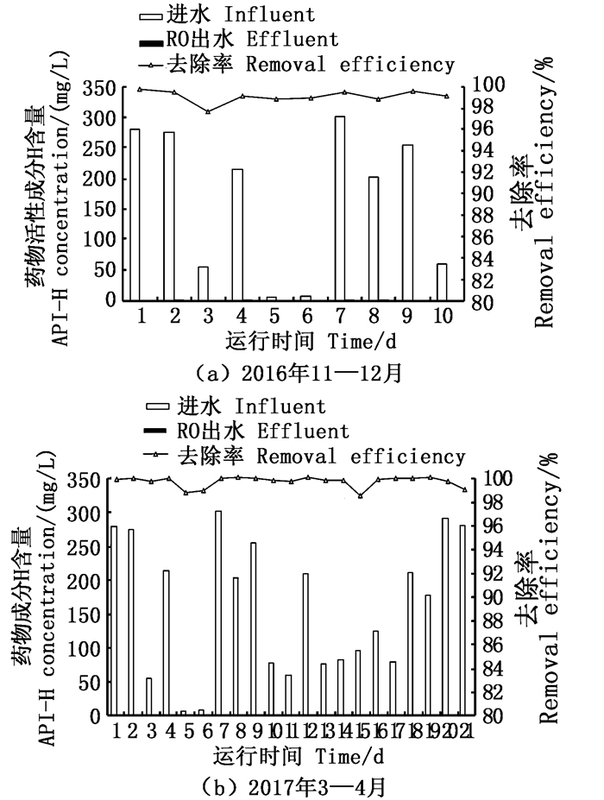 LUO Z. Incineration technology and application of comprehensive treatment of three wastes in pesticide industry[J]. China Agrochemicals, 2010, 6(9): 15-20. 梁华杰, 苏伟, 付强. 反渗透技术在超超临界直流锅炉补给水处理的工程应用[J]. 中国电力, 2012, 45(1): 25-28. LIANG H J, SU W, FU Q. Application of reverse osmosis in feed water treatment for once-through boiler in ultra supercritical units[J]. Electric Power, 2012, 45(1): 25-28. 杨志泉, 刘国林, 周少奇. 电镀废水处理工程应用[J]. 工业水处理, 2010, 30(7): 75-78. 尹晓峰, 金玉涛, 王少波. 反渗透技术在电厂锅炉水处理中的工程应用[J]. 水处理技术, 2011, 37(3): 126-128, 131. YIN X F, JIN Y T, WANG S B. 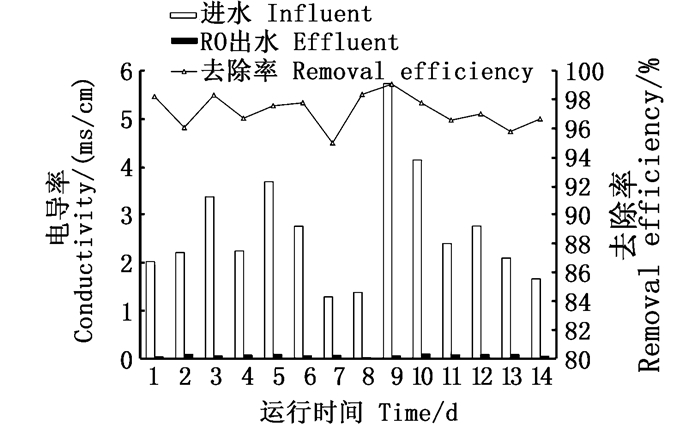 Application of RO in water treatment of power plant boiler[J]. Technology of Water Treatment, 2011, 37(3): 126-128, 131. 汪勇, 邱晖. 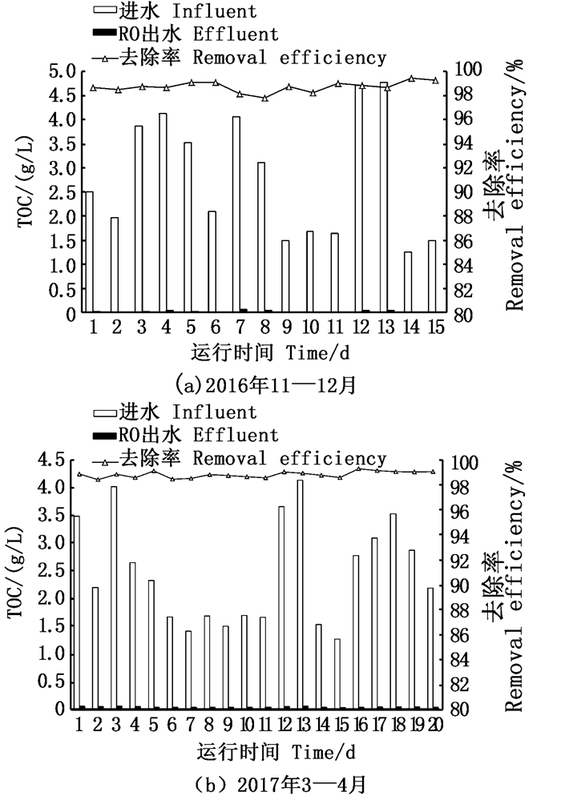 膜分离技术在农药废水处理中的应用[J]. 科技促进发展, 2012(4): 206-207, 209. WANG Y, QIU H. Application of membrane separation technology in the treatment of pesticide wastewater[J]. Science & Technology for Development, 2012(4): 206-207, 209. 董秉直, 陈艳, 高乃云, 等. 混凝对膜污染的防止作用[J]. 环境科学, 2005, 26(1): 90-93. DONG B Z, CHEN Y, GAO N Y, et al. Effect of coagulation on preventing membrane from fouling[J]. Environmental Science, 2005, 26(1): 90-93. 董秉直, 王洪武, 冯晶, 等. 混凝预处理对超滤膜通量的影响[J]. 环境科学, 2008, 29(10): 2783-2787. 迟军永, 曹昌勋. 渗滤液反渗透处理中膜污染清洗的工程应用[J]. 中国资源综合利用, 2013, 31(12): 22-24. 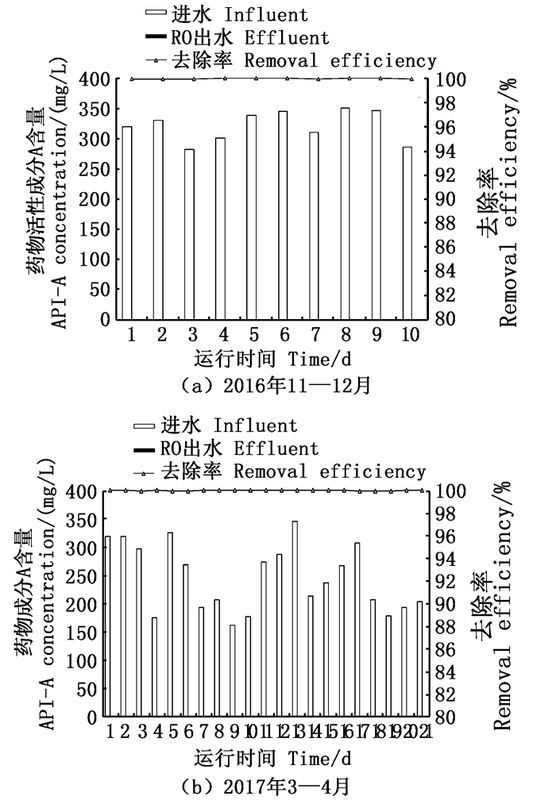 Abstract: The pretreatment-ultrafiltration-reverse osmosis process was carried out in a pesticide enterprise to testify the operation performance. 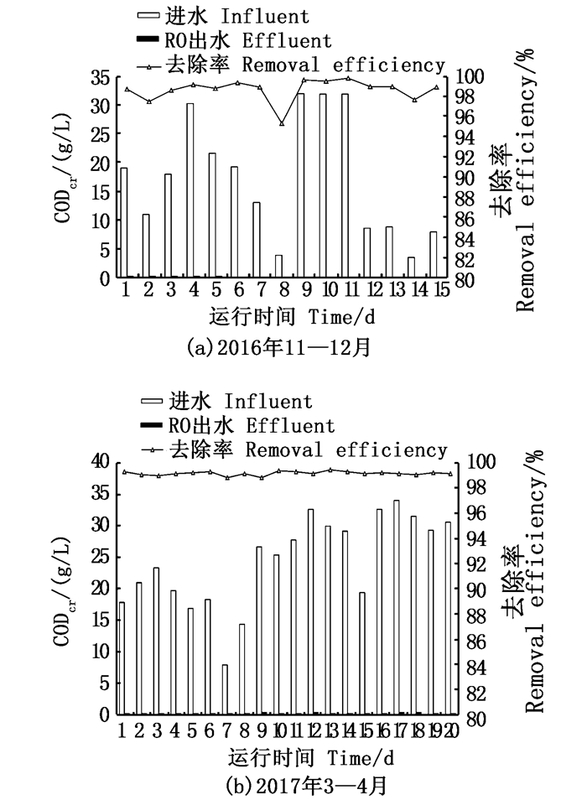 The results showed that CODcr, TOC and the active ingredients of drugs removal efficiency were 98.90%, 98.73% and 99% respectively, the water production rate was also more than 70%, which illustrated that this process was successful, and operated stably and reliably with high treatment efficiency. 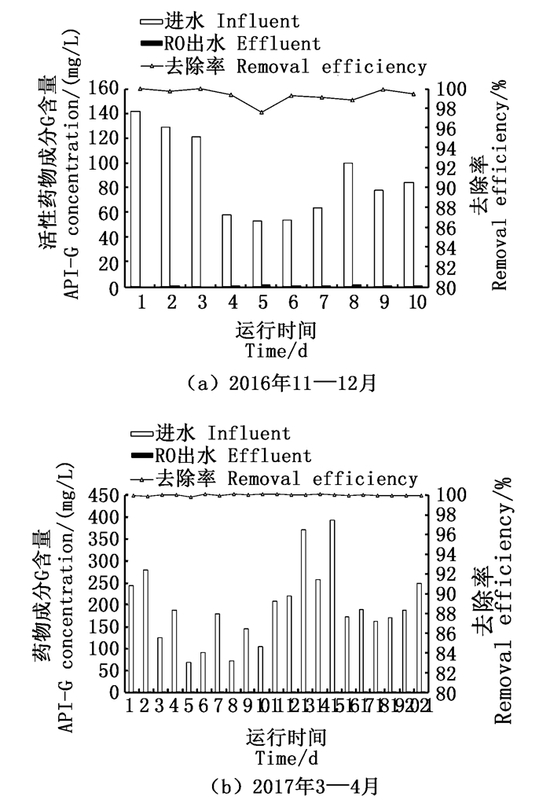 The water quality of effluent could meet the enterprise's internal control standard and this process had remarkable economic benefits and broad application prospect.